Summer is coming and you just want to enjoy that great book I was telling you about, but the kids are driving you crazy. How about giving them something that will give them hours of entertainment and make them so tired you'll get all night to yourself, too. Enter to win below. "Make Our Own Network" solely organized this event and I received no compensation for this publication. My opinions are 100% my own and may differ from your own or even those stated in this post. Girl Who Reads is not responsible for sponsor prize shipment. I'm entering because this would be awesome for my niece, nephew, and other young relatives. 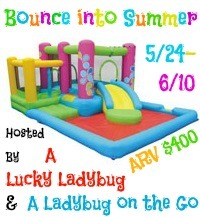 I am entering because I would love to have a summer party for the county foster parent's association and then donate the bounce house afterward! Wow, that would be fantastic for the girls this summer. Only problem would be keeping the bigger neighborhood kids out of it!